Studio IV project by Colin Anderson, Alana Braddon-Parsons and Jolie Lam. An interactive installation that exposes an audience to the double-sided nature of social media. Duplicity is made up of ten spinning wooden panels. 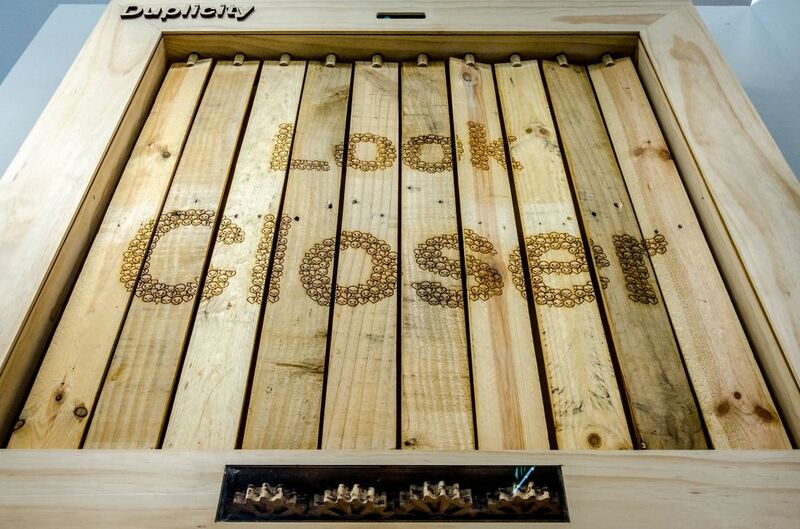 The words ‘Look Closer’ are laser etched to both faces of the panels. The quote ‘Look Closer’ plays an important part of our project as it alludes to our bigger theme of how duplicitous social media. 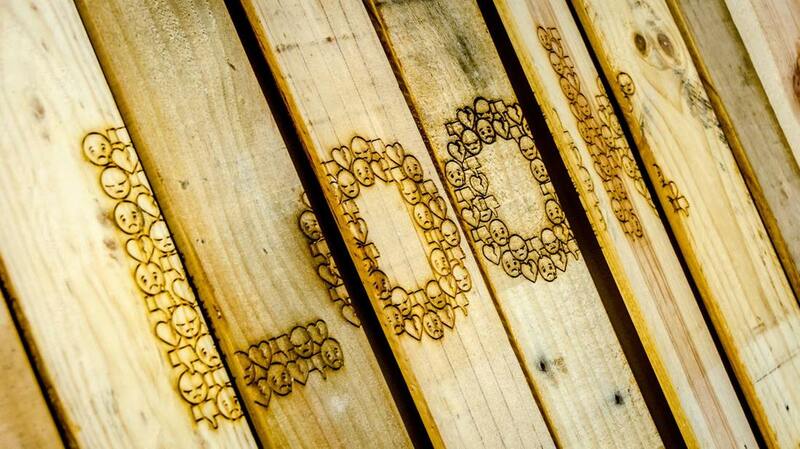 Firstly ‘Look Closer’ provokes the audience to look closer at our installation. If they step close enough to Duplicity, they will trigger the Kinect which will turn off the motor, thus stopping the panels in their positions. Because of ‘looking closer’, the audience can now see the finer details of the panels. ‘Looking closer’ will reveal the wood quality along with the emojis that make up the words ‘Look closer’ to determine whether the audience have stopped on the good or bad side. The good side features positive emojis only; the wood has been sanded down and varnished to a golden hue. This good side represents the ‘perfect’ images people post online that get a good reception from followers and friends; the finishing varnish represents filters that one edits their images with. The bad side of the panels has the exact quote laser etched in the same position as the positive side, however the quote consists of negative emojis. This side of the panels were left in its raw state – having reclaimed the timber from pallets – with rusted nail holes, dirt marks and chipped corners. This side represents the reality of people’s lives, that they do not share because it’s a stark contrast from ‘perfect’ – what society believes to be the norm.